Should we read the Daniel Silva Books In Order? Daniel Silva is the author of the popular Gabriel Allon spy thriller series. If you like spy thrillers, you will want to pick up and read the Daniel Silva books in order of publication, because most of his novels focus on Gabriel Allon, with the exception of a standalone novel, and a few books in his second thriller series about Michael Osbourne. So here are the Daniel Silva books in order of publication, including the two series and the standalone novel. The reading order is listed in brackets for each book in a series. I’ve read pretty much all the books (except the very first one, and Heist, which came out recently and it’s on my TBR list), and I think it’s not a major requirement. However, if you are like me, a stickler for reading them in the proper order for character development, I suggest you do the same. But unlike some other series, if you do happen to read them out of order, you won’t miss a lot of the background. But I can predict that once you read any book in the Gabriel Allon series, you will want to go back and read the rest as well. Don’t say I didn’t warn you! He graduated from the California State University in Fresno with a BA, after which he enrolled at the San Francisco State University with a major in international relations focusing on Russia, and the Soviet Union.. He didn’t graduate, however, as he got a good job offer as a journalist with the United Press International (UPI) in 1984. His initial position was temporary and his first assignment was to cover the Democratic National Convention. Soon, however, he got an offer to work at the UPI full time. After one year of working there, he got a transfer to the company’s Washington, D.C., headquarters. He stayed there two more years, following which he got again reassigned, this time to Cairo in Egypt, where he became UPI’s Middle East correspondent. When he left UPI, he went back to the US and got jobs with Cable News Network, and later with CNN, where he became the producer and executive producer of several CNN programs, including Crossfire and Capital Gang. He began working on his debut novel in 1994, which was published in 1997 with the title The Unlikely Spy, a standalone novel. The book was on the New York Times bestseller list for five weeks. The novel is set in the WWII around the allied invasion of France. This book set the trend for the next spy thrillers the author is so well known about. This is when Daniel Silva left his day job to pursue a full-time career in writing. His next book, The Mark of The Assassin started his Michael Osbourne series in 1998. The Kill Artist, published in 2000 is the 4th novel by Daniel Silva and the one that gave birth to one of the best spy heroes in fiction – Gabriel Allon. The author is well known in the international intrigue fiction circles and Gabriel Allon is a spy that everyone wants to learn about. Reading the Daniel Silva books in order will mostly focus on the complex character of the Israeli secret agent. The author has currently 19 books in total, with 16 in the Gabriel Allon series. The latest novel, House of Spies is published in 2017. At some point, in 2007 there was an offer to option the rights to Silva’s Gabriel Allon series by Universal Pictures. Nothing came of it as Daniel Silva was not entirely happy about the team that would work on the movie. In 2007, however, MGM Television had actually acquired the rights for the Daniel Allon series based on the books, but at this time we don’t have any news on when they will be adapted. Daniel Silva and his wife, Jamie Gangel, are said to be executive producers. He met his wife in 1987 when he was covering the Iraq-Iran conflict, and she was a CNN special correspondent in Israel at the time. The first book I’ve read by Daniel Silva was The Kill Artist. It is the book that stayed with me ever since. I’ve read, in the meantime everything else in both series and let’s just say that whenever I think of the spy thriller genre, Gabriel Allon is the first character that pops into my mind right away. Gabriel Allon first appeared in The Kill Artist, the first book in the same-name series. He is a Native Israeli, what is called a Sabra (a Jewish individual born in Palestine). While Gabriel is Jewish, he is not religious. His first ever language spoken was German. His parents were two Holocaust survivors, and his mother was always reluctant to talk about her past. His father also survived the Holocaust, but he died later at some point. There is not all that much about him in the Daniel Silva books. Gabriel got his name based on his mother’s wish. She believed that although Michael is the highest angel, Gabriel is still the most powerful. Gabriel speaks several languages, including German, English, Italian, and French, all fluently. He also speaks a bit of Arabic and Spanish. In an interview, the author mentioned that he initially intended to create Gabriel Allon for a standalone novel, not for an entire series spanning so many books. His publisher, however, talked him out of that decision, much to the delight of the author’s long-time fans. We wouldn’t be where we are without Gabriel Allon. My husband Billy W. Smith is reading a Death In Vienna, but there are 2 books prior to this one. Please let me know the names of the 2 books that were written prior to this one that set the story for this 3rd book. The book list is accurate with the latest book added. I am updating the author’s bio (actually all the authors’ bios, however, it takes time as I am a one person team), but the list of books is up to date. My new novel, Eternal Sonata, is out October 4. Ray Kurzweil calls it “a brilliant exploration of the many challenges and opportunities our species will face as the exponential growth of real-world technology moves us toward immortality.” Hope you’ll reference or review it. Okay. Now would you please explain what the heck that means for us Ludites . Doesn’te sound like Daniel Silva kind of stuff to me . Sorry . 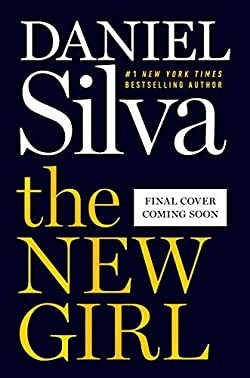 What is the Title Of Mr. Silva’s 17th book and when will it be released? It’s called The Black Widow and it comes out this July. Gabriel is one of my favorite characters.